Enjoy summer’s best fruit in this creamy, sweet, healthy, and delicious peaches and cream kefir oatmeal. It’s gluten free, vegetarian, and full of gut-healthy probiotics to fight inflammation and boost all aspects of your health! I have a new food obsession. It’s creamy, tangy, rich, tasty, and healthy. When I say healthy, I just don’t mean high in protein, calcium, phosphorus, vitamin B12, and magnesium, although it most certainly provides all of those benefits and more. By healthy, I’m specifically talking about gut-health. I am currently writing a post on gut health and probiotics for next week and why it matters for sports nutrition. For now, here’s the CliffsNotes version: our guts, which impact our body’s immune system, response to inflammation, nervous system, and hormones, are kept healthy by gut bacteria (gut flora). Stress, medications such as antibiotics and birth control, training, and other factors can harm good gut bacteria, thus leading to poor gut health and other health problems. Probiotics promote the growth of good gut bacteria and help you maintain a healthy gut. Thankfully, probiotics are naturally occurring in many foods and are easy to incorporate into your diet. Most people probably associate probiotics with yogurt (anyone else remember Activia yogurt commercials from about five years ago?). Greek yogurt is definitely a great source of probiotics, but you can only eat so much of it. However, there are many other foods that contain more probiotics and thus are more beneficial than gut health—such as fermented foods! Fermentation is a naturally-occurring anaerobic (without air) process that utilizes yeasts to convert carbohydrates to alcohols, carbon dioxide, and organic acids. Beer is an obvious example of fermentation, except many American beers lose their probiotic powers when the yeast is killed during pasteurization. So, you should drink unpasteurized beers, because (a) they taste better and (b) they’re good for your gut! Our current beer of choice is an unpasteurized pale ale. Many craft beers are unpasteurized, so do your good and your local economy good by choosing craft beers! I digress. Fermented foods are probiotic powerhouses. Kombucha, sauerkraut, pickles, kimchi, and kefir are all healthy and delicious sources of probiotics. You can learn more about the lacto fermentation process and the benefits of fermented foods for gut health in this informative post from Lindsay at Cotter Crunch. It’s kefir, that tangy fermented milk, that has quickly become one of my favorite foods. Well, that and sauerkraut. We tried make homemade sauerkraut and it was incredible. I’m pretty sure I could eat it with every dinner but that’s probably because I’m half German. But that, my friends, is another recipe for another time. Since I’m not a huge fan of smoothies or just drinking a straight glass of milk, I searched for different way to enjoy kefir and all its probiotic benefits. After trying it a few recipes (it makes amazing mashed potatoes! 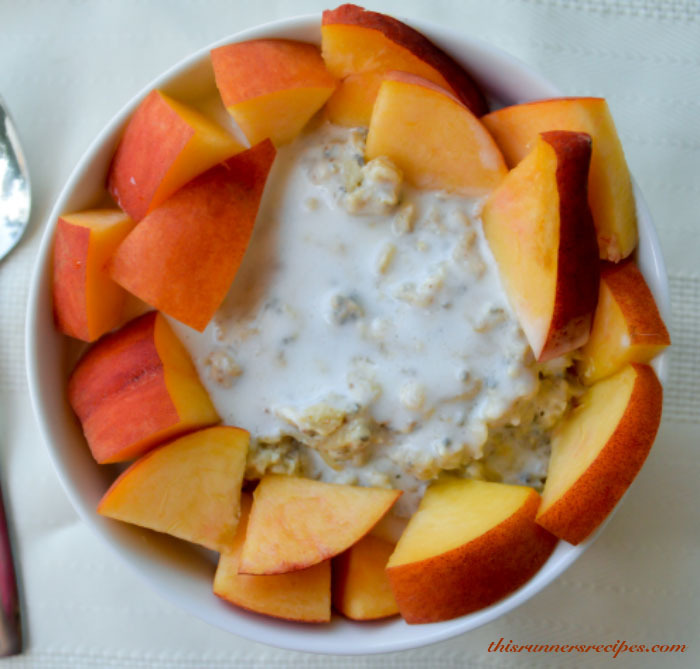 ), I found the perfect healthy summer recipe to share with you today: peaches and cream kefir oatmeal! 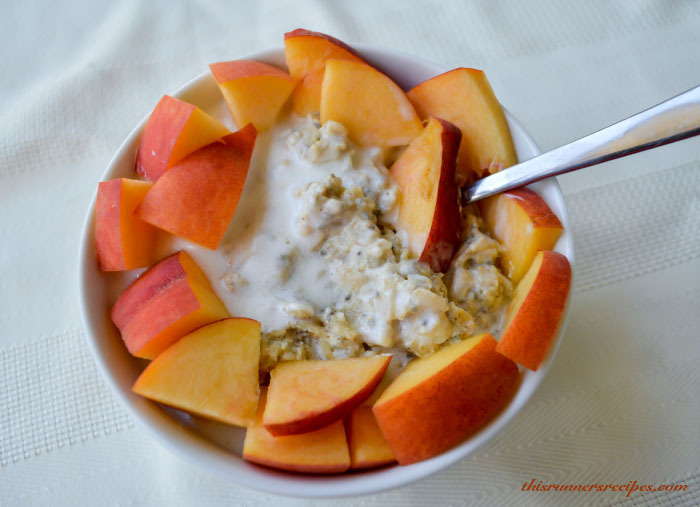 Yes, peaches and cream kefir oatmeal. It’s a healthy twist on a classic summer flavor combination that is sweet, creamy, comforting, and delicious. Peaches and cream kefir oatmeal is also packed with fiber, protein, healthy fats, calcium, and other nourishing vitamins and minerals. I used my typical oatmeal recipe (as seen here and here) for the base oatmeal. While you can use any method you prefer for cooking oatmeal, let me quickly explain the reasoning behind my strange method. I always add one egg per person when making oatmeal. First, this adds extra protein to oats, in part because I eat oats after my runs and want some protein to jump start the muscle repair process. The protein also boosts the staying power, which means you will stay fuller for longer. Second, the egg creates a creamy, almost custard-like texture with the oats that elevates your basic breakfast to the next level. 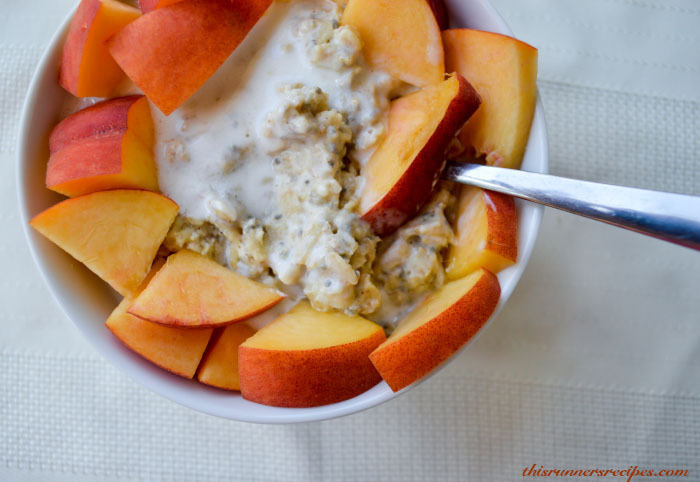 This produces a decadent taste and texture for the peaches and cream kefir oatmeal. I also stir in a couple tablespoons of natural unsweetened applesauce to add a touch of sweetness without any refined sugar. If you prefer sweeter oats, stir in a tablespoon of maple syrup to balance the tanginess of the kefir. Personally, I skip any maple syrup or brown sugar and just rely on fruit for sweetness. 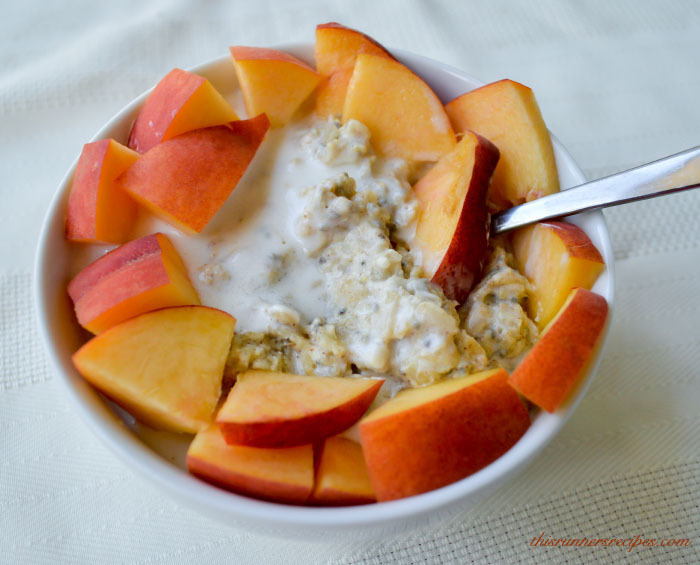 Finally, I always add chia seeds to oatmeal, and this peaches and cream oatmeal is no exception. Chia seeds expand as they absorb liquid, so this add volume and even more texture to the oats, and we all know that higher volume foods feel more satisfying. Chia seeds also provide a plant-based source of omega-3 fatty acids (ALA) to provide inflammation-fighting healthy fats. 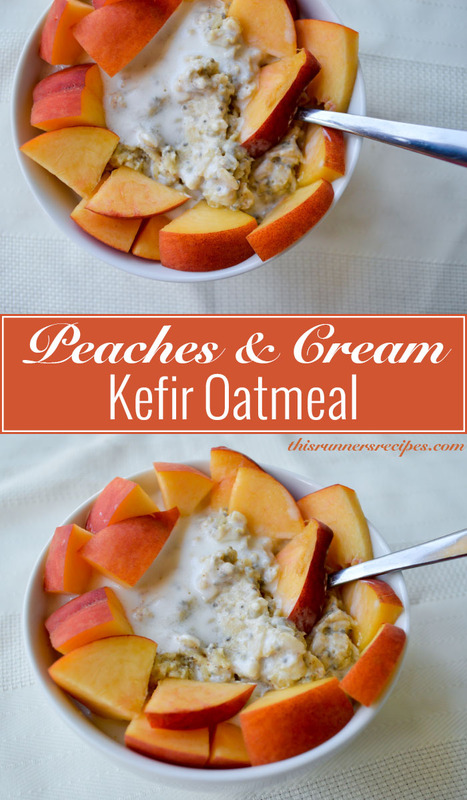 So where does the kefir come into play in this peaches and cream kefir oatmeal recipe? 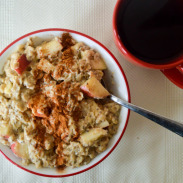 Rather than cooking the oats in it, I poured about 2 tablespoons over the oats to enhance the creaminess of the oats, add a flavorful tang, create that peaches and cream taste, and elevate the overall nutritional profile of this meal. If you’re worried about the slight effervescence of the kefir (due to the fermentation process), there is no need to fret, as you won’t notice it at all once you stir in into the oatmeal. If you adhere to a vegan or dairy-free diet, you can adapt this recipe by substituting in almond milk, cashew milk, or other milk of choice and using coconut kefir. 1. In a saucepan, bring the milk to a gentle boil over the stove. 2. Reduce the heat and cook the oats until the milk is absorbed, about 10 minutes. 3. 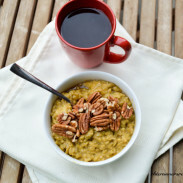 Whisk the egg and applesauce into the oats for 30 seconds or until the eggs is fully distributed and cooked. 4. Stir the salt, cinnamon, ginger, maple syrup (if desired), and chia seeds into the oats. Turn off the stove and remove from heat. 5. Serve a bowl and top with kefir and peaches. Enjoy immediately! This recipe can easily be doubled, tripled, or scaled to feed any size crowd. P.S. This isn’t just me obsessing over some weird food like beets. This recipe is 100% husband-approved! 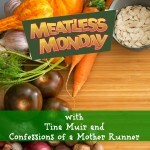 I’ll be linking up for Meatless Monday, so be sure to check out my and other bloggers’ meatless recipes. Thank you to Tina and Deborah for hosting! Have you tried kefir before? How did you eat it? Do you prefer savory or sweet breakfasts? I’m a big fan of fermented foods. I probably would just drink the kefir, as I don’t care for dairy in my oats, but otherwise this is a homerun! Thank you! 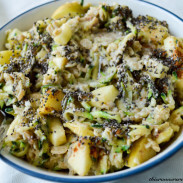 Fermented foods are so the way to go! I’m dairy free so I have not tried kefir before but I do take pre- and pro-biotics. I’m all about the sweet breakfasts (always sweet, all times). I can’t wait to spend another weekend relaxing in the good weather! No plans except a long run and some beach time : ) Hope you have a fabulous day! Coconut kefir is dairy-free! And yes, I’m always about sweet breakfast, but I love savory brinners. Have a great weekend and enjoy your long run and the beach! Yum! I’ve never tried kefir, but I always see it in the store. This looks like a great way to use it! Thank you! It’s really worth trying, it’s so versatile – and makes a great substitute for buttermilk in any recipe! I used to have kefir all the time. I need to go buy a carton! Thanks for the reminder! Yum – I’ve never had kefir, but your pictures make it look seriously delicious! Thank you! You should definitely try it, both Ryan and I really like it and it’s a staple for us now! Yum! Peaches are the absolute best right now, ahhhh it makes my mouth water even thinking about it! Thanks so much for linking up, love the combo with kefir! Thank you for hosting, Tina! And yes, peaches are the best right now and I can’t stop eating them! Thanks for hosting, Deborah, and thank you – the kefir is really quite yummy! Even though I’m not that big on Dairy we do have Kefir in our house. It’s so good for you and your immune system. My kids like the fruit flavored varieties. Your recipe looks so good ! It’s so nutritious – only sweetened with Maple Syrup and a nice healthy boost from the Chia Seeds. Love this. Thank you! I’m not a huge fan of dairy either, but kefir tastes so good and, like you said, has so many benefits. I hope you enjoy the recipe if you try it!